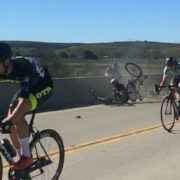 The Carlos Soto Memorial Crit takes place after the Santa Barbara County Road Race in Goleta, Ca. Many riders from the previous days race show up to battle it out in this early season crit. Team riders Scott Winzeler and Tony Rago line up with a field of 57 or so riders for the combined 45+ and 55+ field (to be scored separately). 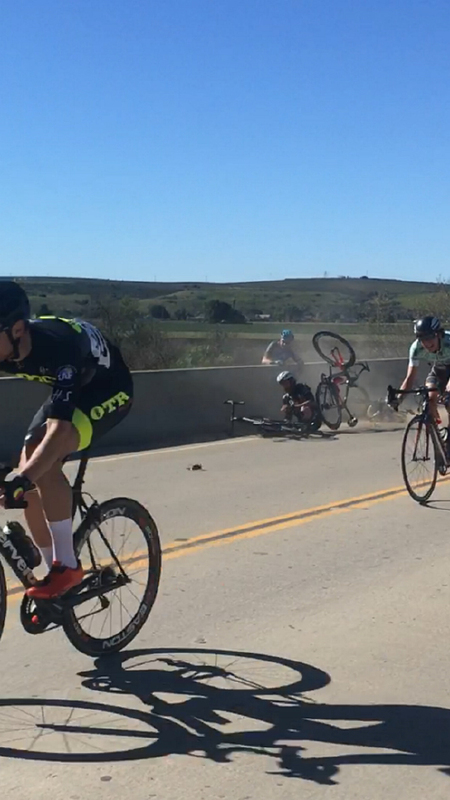 The field had several hitters in it including a national crit champ and several California current and former crit champs. The pace heated up after the first five or so laps and the attacks were plentiful! Finally a two man break did stick late in the race that left us with a bunch sprint finish. Scott was able to seal the 2nd Place spot in the 55+ field and Tony was able to bring home a top 10. Next up we had team riders Nathan Grill, Andy Erickson and Taylor Sisson in the P123 field that was approx. 93 riders deep. Nathan got into a promising split with eight or so other riders but was quickly reeled in by the field. Several attacks and a 2 man break that looked to stick was caught on the last lap, our boys finished with the pack respectively. Great to have that race in the legs for upcoming races! 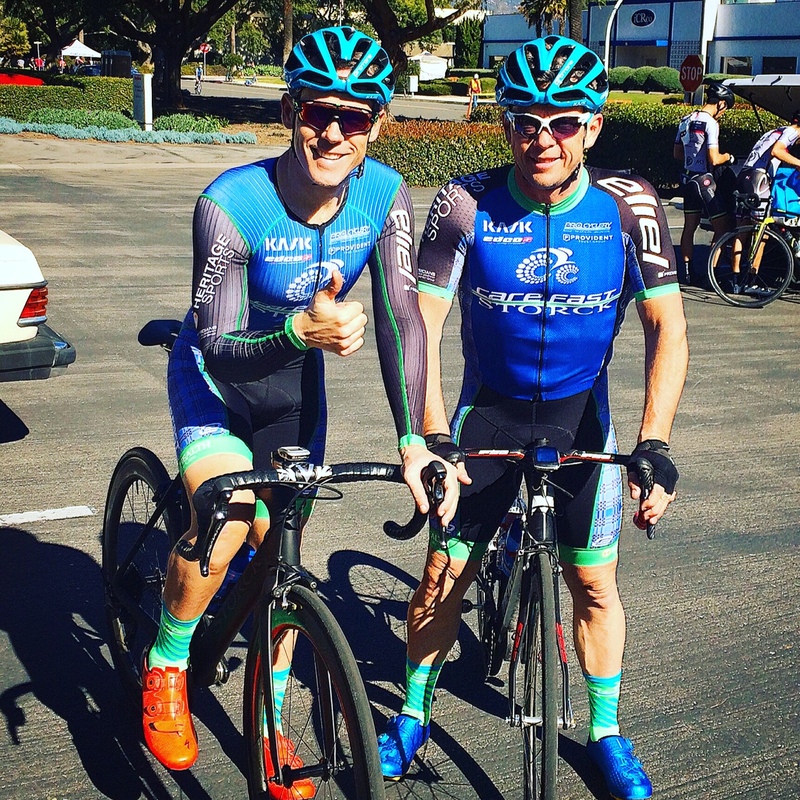 Finally we had team riders Steven Keltie and Sergei Vasilyev in the Cat 4 race. A very early break of two strong riders was able to stay away for the entire race and almost caught the field on the last lap. Our boys finished with the pack and are ready for the next event! 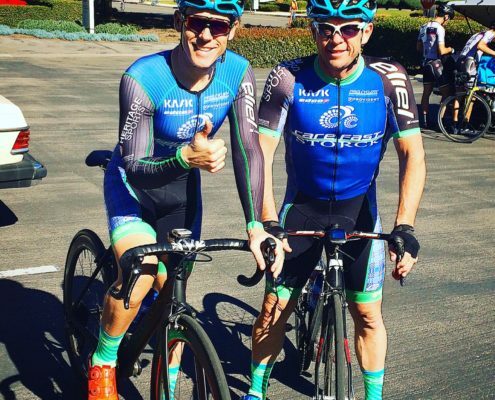 Great work by everyone for a solid and eventful weekend of racing in sunny Southern California! 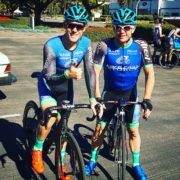 Santa Barbara County Road Race aka Poor College Kids is the first official road race of our 2017 season and we had several riders in multiple categories to test the legs in this season opener. The course had a new start finish that was moved to a road just off the main “lap” and the final run in after the last lap had the sprint crossing a bridge. We all had the same thought going in that this had potential to be a very dangerous final sprint as we were dealing with a center line rule and a barrier (for the bridge) that reduced the lane dramatically. So if it came down to a sprint and the bunch was large it could get ugly. 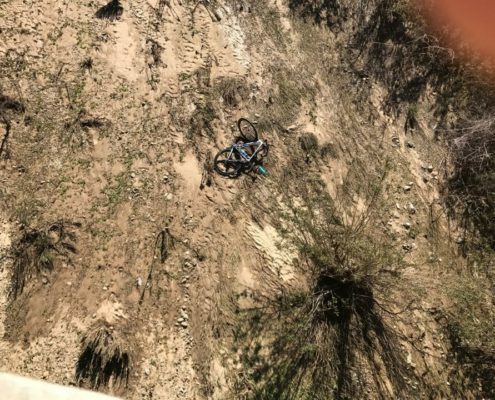 Our intuition was correct and unfortunately our team rider and manager, Mike Allec, was involved in a spectacular crash in the final sprint. As evidenced by the video and pictures below, we are extremely grateful that this wasn’t worse. Mike was making a move on the right side as it was open to do so, he got pinched by another rider and pinned against the barrier. 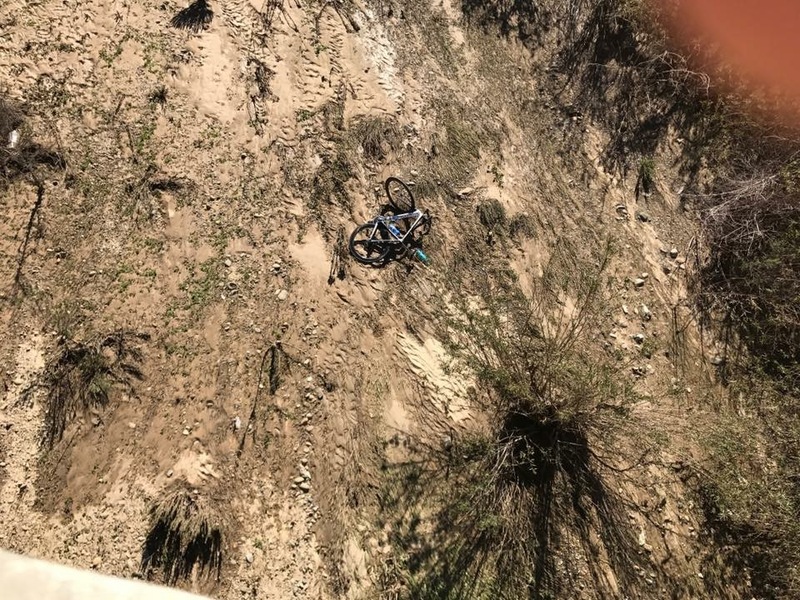 His bike and his body went over the wall, thankfully Mike was able to grab the edge and hang on while his bike went to the bottom of the ravine some 30ft. below! Local personnel were able to quickly help him off the bridge and back to safety with only road rash and a badly damaged kit. The bike however didn’t fare too well and had severe damage to the frame, etc. We are very thankful for the outpouring support from many who were there and more importantly those that helped him off of the bridge. 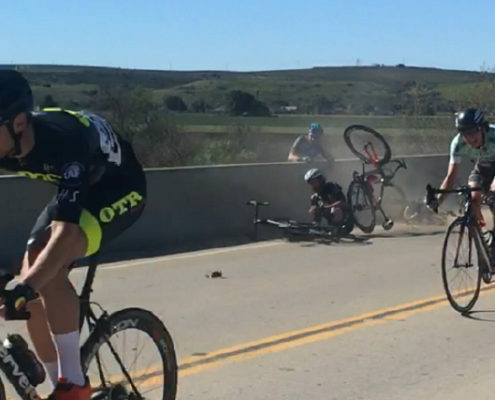 Words cannot express the gratitude for him being able to walk away from this with road rash, this could have ended much much worse. Thank you Peter Aquino for the video and to all of the personnel on site including local emergency crews. Thank you to the nice woman who provided the photos, sorry we did not get your name! 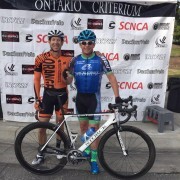 Ice Breaker Crit Ontario, Ca. 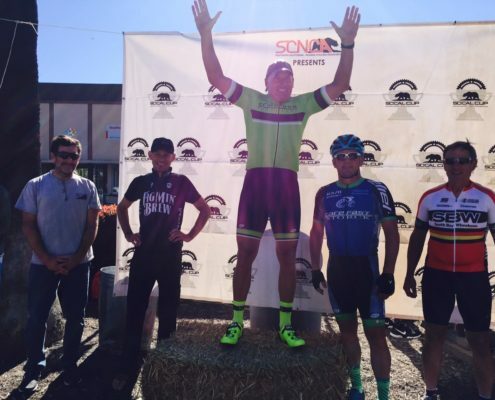 The boys went out to Ontario, Ca., for the Ice Breaker Crit, to mix it up for some early season racing and came back with a win in the 50+ category! 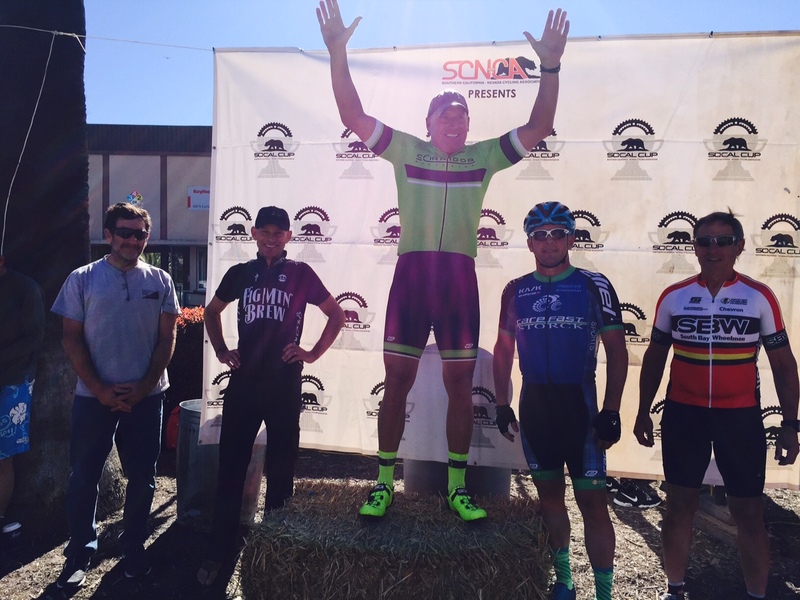 Scott Winzeler, our newest member, lays it down in the final sprint to seal the deal! The second race of the day found Team riders Mike Allec and Scott Winzeler battling early attacks and a break that had a decent gap. Late in the race the break gets pulled back and Scott seals the 3rd place spot! Lastly the Cat 3 race had a hot pace from the whistle and team riders Jeff Mitchell, Mike Allec and Scott Winzeler finished with the pack for a great day of racing! Great work guys! The 2017 season has officially started, please stay tuned and follow us on Facebook to stay up to date on our progress!